My Mind Wanders...: Friday Retro... The 13th? So you have to ask yourself...WTH? How are Lemon/Limes associated with Friday the 13th and women's bodies?? I honestly have no idea. I searched the web, for a while, mixing and matching human/fruit/Friday the 13th and the only thing I found was that apparently Eve ate the fruit on a Friday. Really? If that's the case, then our lady above should be sporting an apple, not a citrus fruit. Enjoy the vintage pic and if you're the superstitious type—stay safe. 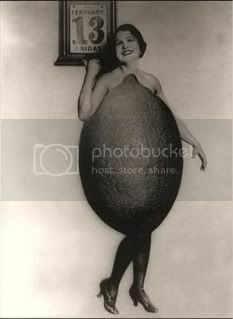 If you're superstitious and a lady… Watch out for giant citrus fruit! I have no earthly clue why citrus and Friday the 13th... ah, the great mysteries of life. Maybe, it was an ad for fruit?? ?